The diagrams demonstrate how bacterial toxins from GCF samples inhibit the test enzymes, particularly Pa and PGK. Samples from different teeth but the same patient showed significant differences in the toxic profile. Particularly noticeable is the 90% (!) inhibition of the test enzymes by the toxins of an endodontically treated tooth in lane 2 compared to the check in lane 3, identifiable by the pallor of the bands. The same specimen (lane 2) also showed high concentrations of bacterial proteases that destroy the creatinekinase (CK) (blue arrows). 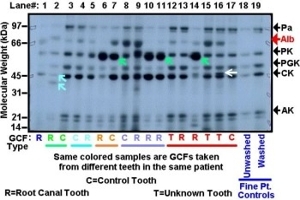 The dense bands in some of the GCF samples (green arrows in lanes 7, 11 & 14, both diagrams) represent the human alkaline phosphatase as an inflammation (HAP). The alkaline phosphatase also reabsorbs radioactive ATP, which is why these “light up” intensely in autoradiography. The clearly identifiable protein in lane 16 of the autoradiogram (white arrow), which escaped detection in the pure electrophoresis (pink arrow), is the bacterial alkaline phosphatase (B-AP) seeping out of the dentinal tubules populated by bacteria. The level of concentration of both these phosphatases correlates significantly with the intensity of a periodontal disease. The presence of human serum albumin (Alb, red arrows) was also verified differently. This serum protein is normally only found in circulating blood. Elevated values therefore indicate an increased permeability of the gingival mucous membrane, possibly as a result of inflammatory reactions. Identification and localisation of focuses Dramatic differences in the bacterial toxic metabolites and proteins in the samples can be identified with this analysis. This selectivity allows reliable identification and localisation of focuses. Lanes 12 – 17 are shown as an example. 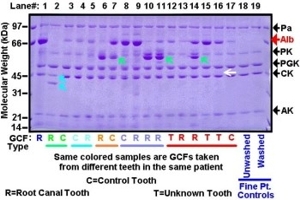 Six GCF samples from the same patient were analysed: one control sample (17), two root-treated teeth (13, 14) and three nonvital teeth (12, 15, 16). The results clearly show that the focus is particularly to be found in the root-treated tooth in lane 14. The radioactive marking of enzymes was suppressed in 90% of the enzymes, with all the remaining enzymes hardly affected. Only in one of the samples (lane 16, white arrow on the autoradiogram) were bacterial alkaline phosphatases found as an indicator of an inflammation.